The designer demands one thing, the coder needs something else. The client watches helpless, as his project timelines resemble the Common Wealth Games. 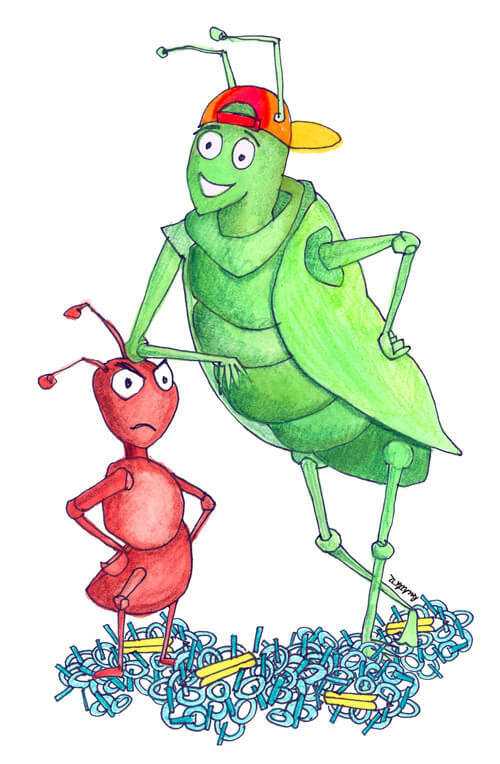 Clients (people and organizations) view coders and designers, like the ant and grasshopper. The ant, the modern information highway worker, toiling on India’s IT footprint, working through the summer, saving for the winter. While the grasshopper sports a weird haircut, talks of exotic vacations while drinking too much wine, the very symbol of deadline dodging laziness, enjoying the present at the expense of the future. They aren’t off the mark either. There is a very palpable socio-economic difference between the coder and designer. Go to an IT hub, spend the day and people watch. What’ll emerge are large Indian conglomerates (think TCS, Infosys) that service even larger conglomerates, built in stand alone cities or ‘campuses’, stocked with thousands of similarly dressed people, who work in similar cubicles and speak a language that is so acronym ridden that it is unintelligible. This is where the engineering supply chain leads–to pools of human resource attracted by middle class promises of roti, kapda, makan. Part of a global chain where English is converted to code, a job that no one else wants to do, at the price of a bag of chips in a ‘developed’ country. This not engineering, not problem solving, this is ‘coding’. This is the celebrated anthill, the temple of post-liberalization India. So lets see the grasshoppers. There are two major design colleges in this country (NID & Shrishti) each with a tuition fee and loan options, which place them above the reach of most people. Plus, it’s not seen as a ‘career’ (that is reserved for engineering, medicine, law and accounting) you can even do it if your grades aren’t great (the horror!). No wonder that designers tend to come from affluent backgrounds. No wonder that certain things are beneath them, the priorities are just not the same as the ant. The grasshopper can make merry, it can afford to do so. It’s not surprising that when you put the ant and grasshopper together, things don’t automatically work. The ant wants a steady income, while the grasshopper wants to experiment. The grasshopper wants aesthetic; which is not a coding term to the ant; who hasn’t even heard of it. They want different things, this not a product of what they have studied (both professions are based on solving problems) but who they are and where they come from. What neither one can deny is that in our digital existence, the ant and grasshopper are co-dependent: that code must embody design and design must work in code. It is time for each to open to the other. Otherwise the coder will always be the lowest member of a global development chain, working on backgrounds and servers; never creating that one game that changes the world (think Angry Birds). While the designer will stay buried in paper, dismissing ‘tech talk’ and living in a bubble where the work disappears. And both will watch, as foreign agencies will scoop up all the work that they had once dreamt of doing. ANTS and GRASSHOPPERS UNITE ALREADY! Arjun Jassal is the HeadAnt at BlueAnt Digital Intelligence. When not dreaming of an augmented-cyborg-led world, he consults people and companies on making their message heard via social media, mobile apps and all things digital. He often wonders why the world is divided between Ants and Grasshoppers, and how great it would be if sentient robots could replace them all. This post is the result of long, lengthy conversations with Arjun about the nature of the so-called “digital divide”: that thin, inexplicable line that separates Indian designers from coders, preventing them from working together on really great digital design projects. This is a realisation that came out of a trip that Aditya and Ruchita made to the Kyoorius Designyatra last year. Here are their observations and comments on Little Design Book. Indeed a wake up call for all designers. I agree with Arjun. Its important to be a technically strong designer and a coder to be creative. It doesn’t necessarily mean they gotta swap but overlap at some point. What a strange bias against designers – while generalizing the attitude of designers is commonplace, I find it a bit insulting to read “No wonder that designers tend to come from affluent backgrounds” and many other such statements. And to end with a coda that suggests we should all unite is pretty disingenuous. How about a more even-handed and specific argument? code is poetry but the coder may not be necessarily a poet. designer is a dreamer at his/her best but hates reality. but in the argument i would say in an “interactive” perspective coder got an upper hand. Working only with designers and coders from Delhi ? @UMD i dont think designers hate ‘reality’. Please look at some of the design projects that have been developed to intervene with real world issues, if you are really curious, i would be happy to share some links, or contribute an article to this portal. Design thinking and application in the last few years has seen a massive push towards process that take multiple stakeholders into consideration, but that does not mean that exercises on aesthetic exploration has taken a back seat either. @arjun : I guess a few of the problems in India right now when it comes to design and technology talent is : A lot of designers who are there in the field have had either a very limited exposure to the mechanism of “computation”, or they have only seen the “evolved” front end of computation. In the case of computer engineers/coders a majority has seen “computation and coding” in isolation as an enterprise software solution and therefore unable to connect the dots and view it as part of a larger context and recognize the innovative and creative potential in its application. And the section of designers and coders who have had the “privilege” of having a paradigm shift/exposure/hardwork to see and understand design and technology in isolation and combination feel a pull towards an experimental application and not necessarily in the ‘web design/interface design’sphere. I feel that everyone needs an elemental understanding of the mechanism of computation, and some understanding of specific coding platforms relevant to their industry, but beyond that with the spurt of various niches one is still free to go their chosen way. Sorry for this thread of comments, wanted to add that i feel there are some simple solutions to optimize the work flow between these parties. Though they might come from different backgrounds there are systems which can streamline the process and avoid discrepancies. But on the socio-cultural front, i feel it is a matter of awareness, and respect for the common goal of getting the work done. The years of design education just makes us grasshoppers too different from the rest, visibly and at every level of work. Despite the fundamental differences, all it takes is mutual respect for things to work well. Besides, more and more techies, or people in general appreciate good design and respect the effort that goes behind it, and designers are forced to delve into technical aspects to simply survive. I don’t know much about NID, but have you seen the curriculum of the design courses at IIT Bombay! ?